This short 2.4 mile loop takes you along the Appalachian Trail, the Neighbor Mountain Trail and the Hull School fire road. The highlight of the loop is a visit to the Byrd’s Nest Day Shelter. Byrd’s Nest #4 sits in a lovely opening off the Neighbor Mountain trail. 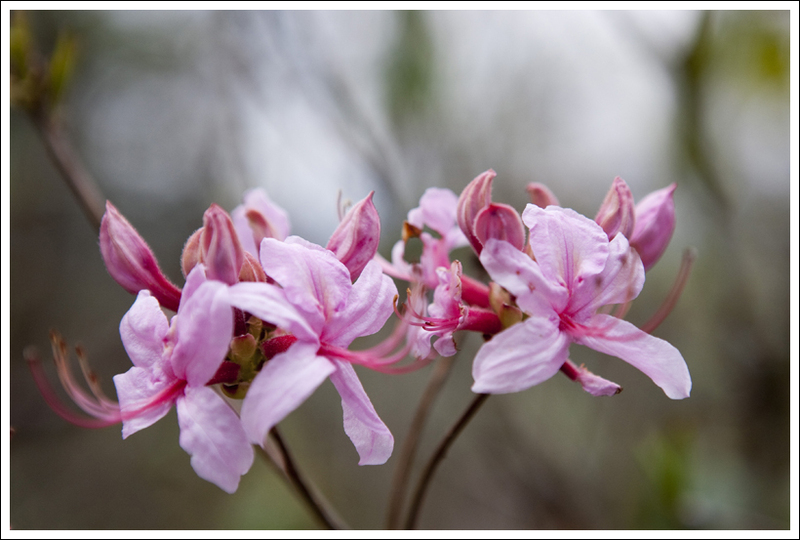 Below: Parking is available at the Beahm’s Gap Overlook; the trail begins after crossing the railing; Blooming azaleas along the trail. We were supposed to go backpacking, but when we heard terms like ‘flooding rains’, Nor’easter and ‘wash out’, we decided to delay the trip. When Saturday morning dawned, it was sunny and warm and beautiful! I made a trip into town, worked on a photography project in the arboretum, bought a bunch of veggies and strawberries (yay!) at the farmers’ market and got a haircut, figuring that the rain had to be on its way. When I got home, it was still sunny and gorgeous with no sign of the coming deluge. Adam suggested we hop in the car, go for a short hike and then have lunch in the park. It sounded like a great idea to me, so off we went. We decided on the short Byrd’s Nest #4 loop, starting from the Beahms Gap Overlook. The trail started with a hop over the retaining rail at the overlook – a cement trail marker post will show the spot to cross the rail. 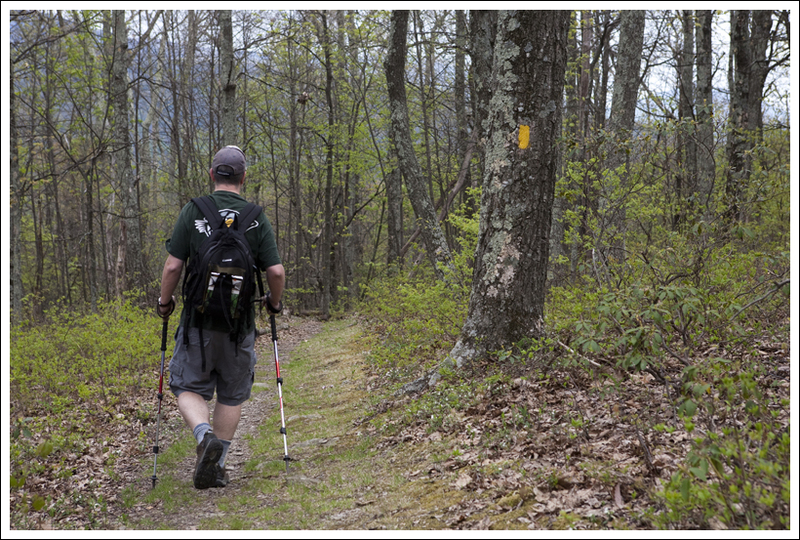 The trail goes slightly downhill along a short spur to the Appalachian Trail. Follow the AT north until the junction with the Neighbor Mountain trail. Take a right onto the Neighbor Mountain trail and follow it uphill until you reach a clearing and the Byrd’s Nest shelter. For the return trip, follow the grassy path in front of the shelter downhill. The path quickly widens to the Hull School fire road. After a few tenths of a mile, you’ll come back out on Skyline Drive. Follow the drive south for about a tenth of a mile back to your car. Adam hikes along a rocky section of the Appalachian Trail. Although there are no sweeping views or rocky outcroppings, this hike is a lovely leg-stretcher. The Byrd’s Nest shelter is a perfect place to enjoy a picnic lunch. We had planned to relax at the shelter for a while, but when we arrived we found it already occupied by a picnicking couple. Not wanting to infringe on their space, we took a few photos and headed back on the return arm of the hike pretty quickly. We decided to have lunch at the Big Meadows Wayside. It was packed – more crowded than we’ve ever seen it! They had some new selections on the menu, which was a pleasant surprise. The menu has been pretty much the same for years! I got a grilled chicken sandwich with roasted red peppers, provolone cheese and aioli. It was surprisingly juicy and delicious. You don’t expect amazing food from park concessionaires – but this was actually one of the best grilled chicken sandwiches I’ve ever eaten. Go figure! It was still beautiful and sunny when we left the park around 2:00 p.m. – but by 4:00 heavy thunderstorms had moved in and it rained pretty much non-stop the next 48 hours. I was glad that we had decided to postpone our backpacking trip. 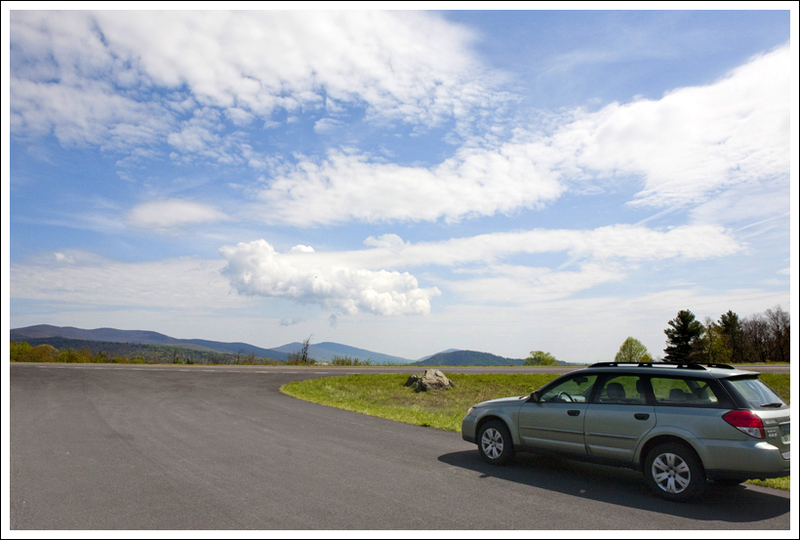 I was originally thinking that we would just take a drive on Skyline Drive when I whisked Christine away. 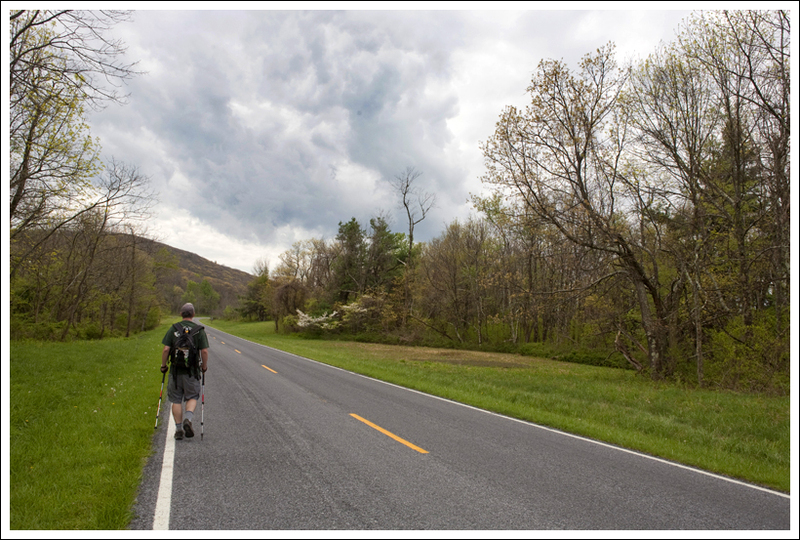 But, I decided to bring our Shenandoah National Park Falcon Guide hiking book and had Christine thumb through to find this hike we hadn’t completed yet. We had done the majority of this trail before on our Appalachian Trail hike from Elkwallow to Thornton Gap. The last time we had been on this trail, we saw the post that showed this side trail, but we decided to avoid more hiking. The Falcon Guide book actually mentioned another trail that should have looped back to the AT, but that trail no longer exists (at least the posts have been removed). A front view of Byrd’s Nest. Below: Adam walking along the Neighbor Mountain trail; A few dark clouds rolled over on the short section of road walking at the end of the hike. They quickly passed and blue skies returned. 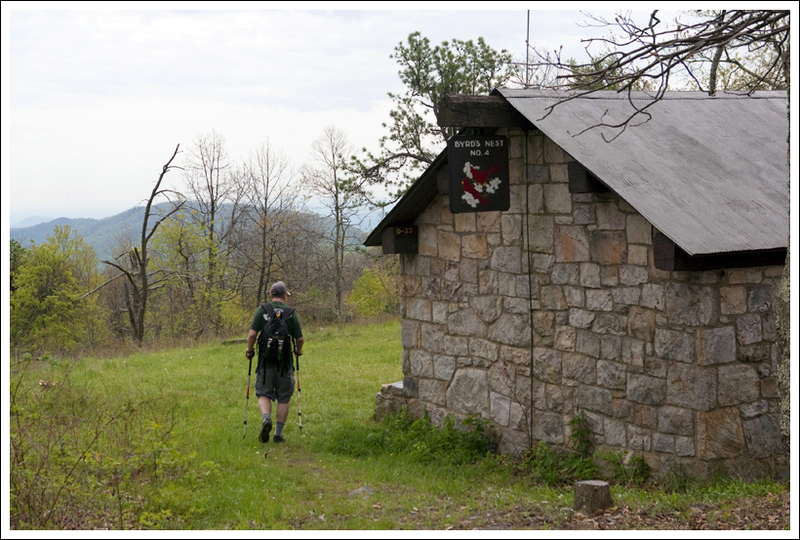 The cabin is named for Senator Harry Byrd Sr., who donated four of these shelters for the national park (the other three are at Old Rag, between the Pinnacle and Meadow Spring Trail, and Hawksbill mountains). His name also graces the Visitor’s Center near Big Meadows and he hiked Old Rag annually into his 70s. 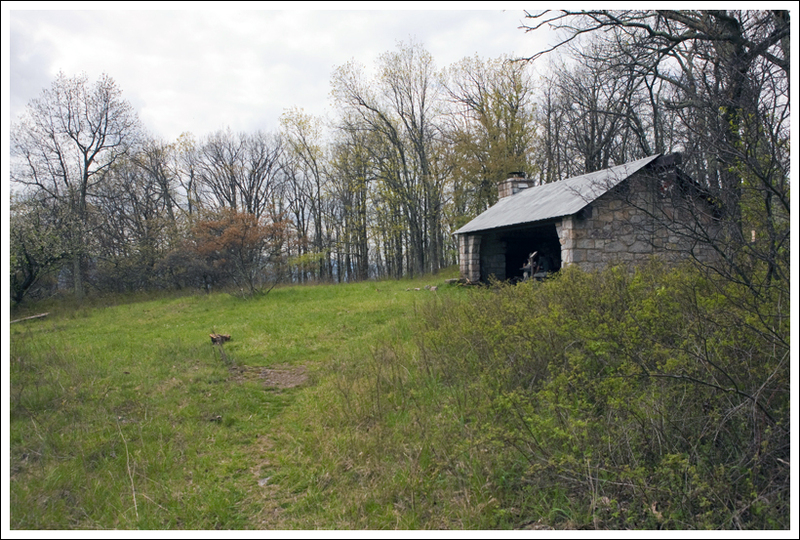 It appears that the cabin up here must have had a few other buildings or other things nearby since you can see some nearby foundations. I’m not sure if this area once served as someone’s home or if it was an overnight shelter with a spring and a privy. It is listed as a day-use shelter only. Once we descended from the shelter down the fire road, we both thought we saw a bear dash off into the woods. We saw a black shape and a big crashing through the brush, so we are convinced it was a bear. The cabin is definitely the highlight of the trail, but we were disappointed that others had taken it completely over to eat lunch. So, we quickly got on our way to not interrupt them. 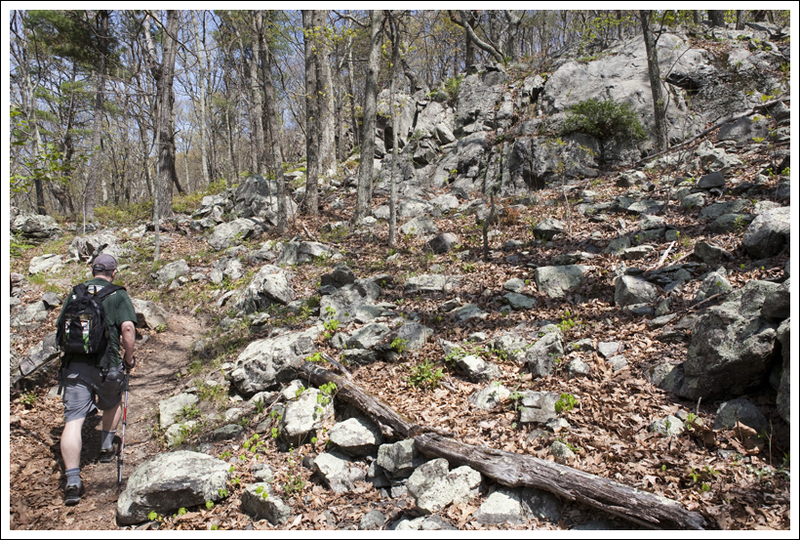 Overall, there are definitely more interesting trails in Shenandoah National Park. But if you want a quick hike with a possible place to eat a packed lunch, this could be one for you. Difficulty – 2. There is a substantial amount of uphill climbing, but the overall distance is short. Trail Conditions – 5. The trail is in excellent shape, like most of the AT through Shenandoah. Views– 1.5. There is a partially obscured view at the Byrd’s Nest Shelter. It was probably much more panoramic and open when the shelter was originally built. Streams/Waterfalls –0. There are no streams or waterfalls, but you will pass a spring-fed water source. Wildlife – 3. We heard lots of birds, and *think* we saw a bear. Ease to Navigate – 2. After leaving the AT and Neighbor Mountain trails, it was all guesswork. Nothing was marked and the description of the trail in our Falcon Guide was inaccurate. Solitude – 3. This is a fairly popular family hike. 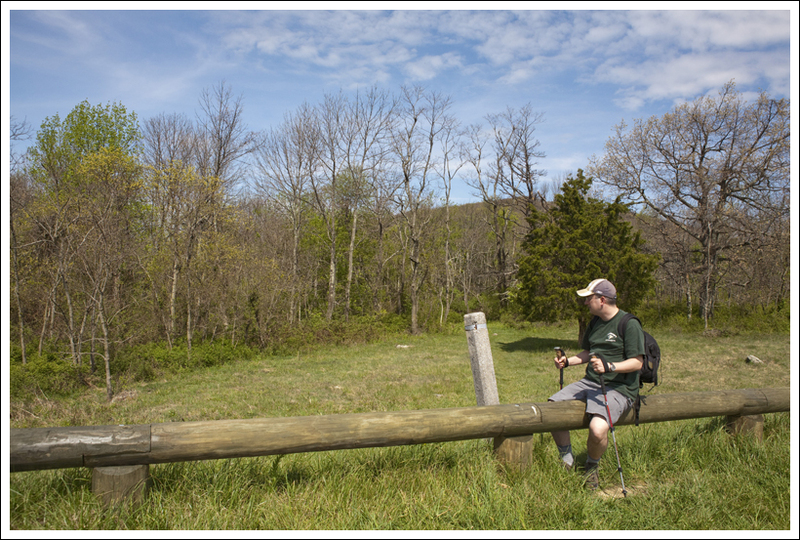 Directions to trailhead: Park at the Beahms Gap Overlook parking lot around mile 28.5 on Skyline Drive. From the lot, you should see a cement post marking the start of the trail on the other side of the log barrier.